Marion Hollins was born on December 3, 1892, to a socially prominent and wealthy family in Gatsby country – East Islip, Long Island. She was the consummate athlete, and was proficient in all sporting endeavors she undertook, including; golf, anything equestrian, tennis, marksmanship, swimming, and car racing. Although we at Pasatiempo mostly recognize her golf accolades, to many Marion was considered the greatest horsewoman of the century. At age twenty Marion emerged into the competitive landscape of amateur golf as runner up in the Metropolitan Golf Association Championships. 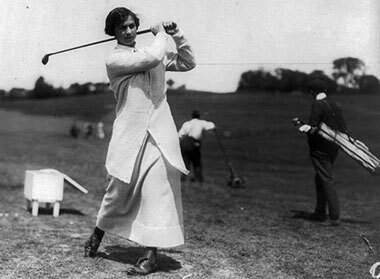 In 1913 Marion made her first bid for the U.S. Women’s Amateur Championship, and in 1921, she defeated Alexa Stirling to become the reigning U.S. Womens Amateur Champion. In addition to the Amateur, Marion’s golf legacy includes three Metropolitan Golf Championships, two Long Island Championships, and an unequaled eight Pebble Beach Championships. In 1932, Marion was chosen team captain in the inaugural Curtis Cup matches played in Wentworth, England, pitting the best U.S. women amateur team against the best British/Irish women amateur team. It was noted by many players that Marion’s strategy led the U.S. to an upset victory over Joyce Wetherd’s British/Irish team. Marion was a pioneer in the field of golf course development, and is considered by some to be the only woman to be a golf course developer. In her life she developed three world class golf courses: The Womens National Golf and Tennis Club, Cypress Point, and Pasatiempo. Marion’s pioneering spirit created the impetus to develop a golf and tennis club exclusively for women, and hence the genesis of the Women’s National Golf and Tennis Club. To succeed in this endeavor she would go to Britain and study the great courses to gain an appreciation of golf architecture. There, she would also meet Ernest Jones, legendary golf instructor, and secure his commitment to be the Women’s National head professional. Ernest would subsequently become the first head pro at Pasatiempo. In 1926 Marion was introduced to S.F.B. Morse, the developer of the Monterey Peninsula. This introduction would lead to Marion’s second golf course development, Cypress Point, a course considered by many to be the greatest golf course in the world. 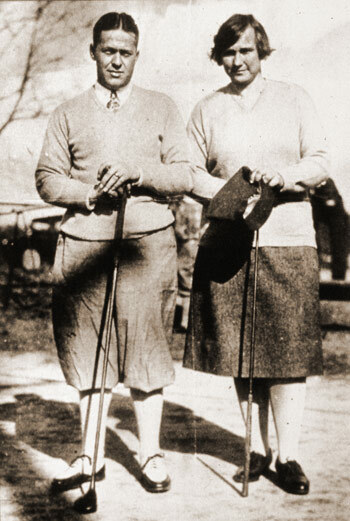 It was at Cypress that Marion developed her life-long friendship and professional relationship with the World Golf Hall of Fame architect, Alister MacKenzie. From opening day in 1929, to the day she left Pasatiempo in 1941, Marion hosted the likes of Bobby Jones, Will Rogers, Mary Pickford, the Rothschilds, the Vanderbuilts, Babe Zaharias, Spencer and Louise Tracy, and many others. Pasatiempo was a haven for the Hollywood crowd, and a great destination spot for the East Coast socialites. Simply put, Marion was an incredible person, and given the period of history in which she lived, is perhaps unequaled in her contributions to the legacy of golf. For more information about the life of Marion Hollins, we recommend Champion in a Man’s World by David E. Outerbridge, available at the Pasatiempo Pro Shop and through bookstores around the country.